1For Republicans, international concerns now dominate. When asked about what they feel is the nation’s most important problem, 42% of Republicans cite an international concern – terrorism, the Islamic militant group ISIS or another national security issue – while just half as many (21%) mention an economic issue. That’s a dramatic reversal from a year ago. In December 2014, just one-in-ten Republicans (11%) mentioned an international issue – 3% said national security or defense issues, 2% said the wars and 1% said terrorism – while more than a third (38%) cited an economic issue. 2 Republicans broadly support an aggressive approach toward ISIS and global terrorism. Twice as many Republicans as Democrats favor the use of U.S. ground forces to fight Islamic militants in Iraq and Syria (66% vs. 33%). More generally, there are stark partisan differences over how the United States should deal with global terrorism. 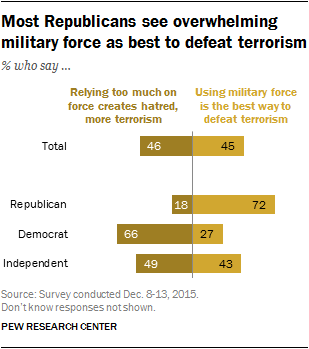 Fully 72% of Republicans say that using overwhelming force is the best way to defeat global terrorism. Among Democrats, just 27% favor the use of overwhelming military force, while 66% say relying too much on military force creates hatred that leads to more terrorism. 3 Republicans are more concerned than Democrats about a number of overseas security threats. There are substantial partisan gaps in concerns over global threats – including ISIS, Iran, Russia, China and the Middle East. Republicans are more likely than Democrats to view each of these issues as a major threat to the well-being of the U.S. Notably, more than nine-in-ten Republicans (93%) cite ISIS as a major threat, compared with 79% of Democrats. 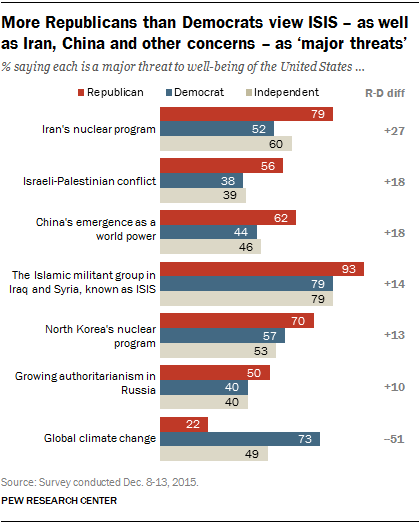 Republicans also are also far more likely than Democrats to view Iran’s nuclear program as a major threat (79% vs. 52%). By contrast, Democrats are more than three times as likely as Republicans to say that global climate change is a major threat to the U.S. (73% vs. 22%). 4In September, Republicans opposed the U.S. decision to accept more refugees. Three months ago, before the terrorist attacks in Paris and San Bernardino, Calif., the public overall narrowly approved of the United States’ plan to accept more refugees fleeing violence in Syria and other countries, but the partisan differences were stark. Two-thirds (67%) of Republicans said they disapproved of the plan; a nearly identical share of Democrats (69%) approved of it. 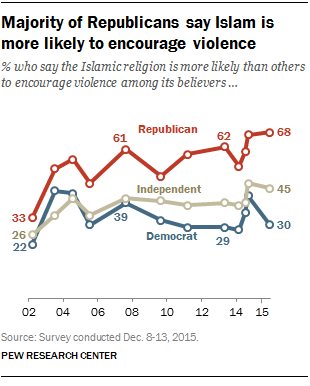 5 Most Republicans associate Islam with violence. Americans are divided about whether they see Islam as more likely than other religions to encourage violence among its believers: 46% say it is more likely, while 45% say it is not. Fully 68% of Republicans view Islam as more likely than other religions to encourage violence, compared with just 30% of Democrats. When this question was first asked, in March 2002, just 33% of Republicans (and 22% of Democrats) said Islam was more likely than other religions to encourage violence among its believers.